Hey everyone I am chiming in to throw out a Merry Xmas to everyone here! I've been busy with restoring the house I'm living in here as well as the usual never ending work. In between working I've been sneaking away to ride offroad bikes whenever possible. Every year during this time I hit the road and try to visit a few friends throughout the Christmas day. Today I jumped on the dual sport and went to visit some friends that were dirt biking around. The more I ride this Yamaha WR200 the more I'm amazed at it's versatility. 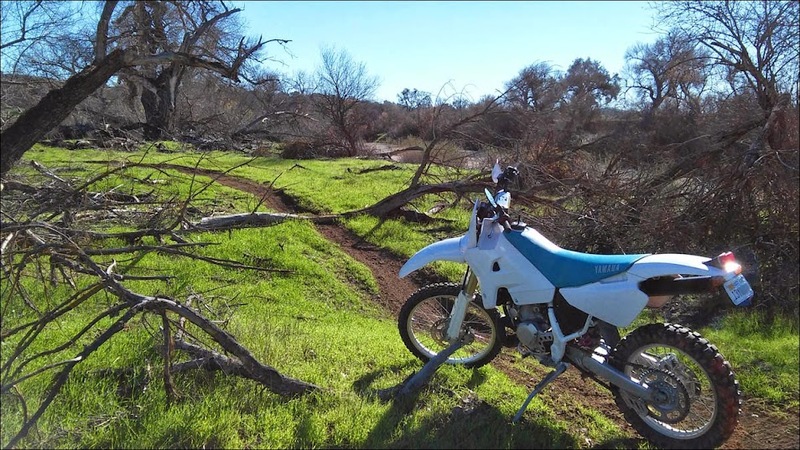 The recent wet weather has really made this winter a good one for riding here in CA. It's a California winter here which is very warm I know. It's not winter here - it's just winter time. It it were actually cold I would be here online much more! If anyone cares - I'm just thinking out loud - Dirt bikes have taken over the garage and I'm nearly done with a Yamaha 250F four stroke motocross bike I'll be racing a couple times this year. I've stripped it down to the frame and put a new top end in it. It's a five valve head that is extremely durable compared to the competition. Unlike the other brands it also has an external oil reservoir tank for additional oil cooling and capacity. I've upgraded from a slightly older Suzuki 250F that I completely rebuilt and a friend decided he wanted it more than I did. I'm more of a Yamaha guy myself. I just had always wanted to try a Suzuki for some reason. That chapter is over and I was happy to sell it to a friend so I still get to see it and ride it if I want. I'll be going over the whole Yamaha YZ250F build in a separate thread I intend to start up soon. Another reason I decided on this particular bike is because a friend has a same year model Yamaha 450F. His bike has a lot of hours on it and the bike starts up very very easily. When he bought that 450 and he went riding along with me on my Suzuki 250 he was able to start his bike so much easier. I knew right then and there I was selling the Suzuki and going for a Yamaha 250F. I can't wait to have a little spare time to start putting this Yamaha together. What takes the most time is cleaning every single nut and bolt as it goes back together. I spent over and hour cleaning the shock alone so the time really adds up. The bike was beat up, very dirty and mud-stained. Anyhow I hope to use a little holiday time to work on this Yamaha. I hope everyone else is able to sneak away to the garage or the shop to twist some wrenches, get their hands dirty or do a little riding. HaPPy HoLidAys! Last edited by Smithers; 12-25-2014 at 10:26 PM.